If you’re like me, you remember the days when you dressed up in your favorite costume, armed with a pumpkin pail, and going merrily from home to home in your neighborhood heisting candy from the neighbors. Maybe for some of you, that was your first experience with dynamic presentations! You have to put on a great costume (my favorite was Captain America) and delight your “unsuspecting” audience so that they will give you a treat. It’s all about presentation, right? Content is important…but the delivery is vital to the success of your presentation. I consider Wayne Botha a mentor and expert on PowerPoint presentations. I just a read a great post from him on the subject. Do you use PowerPoint in your presentations? If so, read this article by Wayne by clicking here. Posted on October 21, 2008 CategoriesUncategorizedTagsBusiness, Presentations, speeches1 Comment on What Are You Teaching? I just came back from teaching a one-day continuing education session for insurance agents. The topic is Commercial Property Insurance for about 6 hours and then they are tested. As part of the program, they fill out an evaluation form on the class and me. This is a course set through a local association that runs it for a national society for insurance education. In other words, it’s their evaluation form. I’ve always wished that instead of grading me on a scale from 1 through 10, that I’d be able to know how many participants actually passed the class. To me, that is the best criteria for this particular situation. Yes, they will take some information back to their workplace with them. Half of them are personal lines agents and may never touch commercial insurance again. But to be able to help them to pass the exam is my biggest goal for them. Darren LaCroix always taught me, “What do you want your audience to think, say, or do after they walk out?” In this case, I want them to pass. Do you teach your audiences? regardelss of your presentation or subject, you have the attention (let’s hope) of the audience for a certain period of time. What do you want them to think say or do when they leave? What value do you give to them? These are questions you must ask yourself as a business presenter before every presentation – whether its a sales presentation or an investor meeting. What is the output your audience will take away from you? If you are a professional business presenter, tune in for tonight’s final presidential debate. Regardless of your political leanings, this is the Super Bowl of presentation skills. Why? You have two men vying for the most powerful position in the world. You have less than a month to sway undecided voters and confirm the ones you think you have. And, you have a chance to cement your identity to a country that has become very visual and swayed by presentation. Eye Contact – with both the audience AND with each other. Uhm and Ahs. I know this is bigger than Toastmasters but this is still an important part of being a solid presenter. Gestures. McCain is limited by POW injuries but facial expression counts. Obama has used gestures effectively. Warmth. Yes, you read that right. Too much of the time both candidates can look grim. Let’s see who evokes the most warmth to connect with the audience. Sizzle. Who sells the sizzle best. I’m sure CNN and all the cronies will give their opinions. I’m interested in yours. When was the last time you spent a day and a half working on your presentation skills and finding ways to earn more money through your knowledge? For the nine members of my Varsity Speaking Academy, it was just this past week. Regardless of your vocation or career, you have intellectual property that is going to be valuable for someone else. Intellectual property is your knowledge, experience, resources, and strategies that you’ve either lived or created. What impact can you have on others? During the Academy, these fine folks were able to brainstorm ideas and help each other to focus on what value they can provide to others in their different fields of business or life. There was an exhilarating feeling of being able to not only learn what you can do, but to help others achieve their dreams. It’s way too early to start thinking about 2009 “resolutions” so just start now. Find opportunities to increase your development as a professional. Keep an eye out over the next month for my upcoming educational sessions. You will be glad you joined! First Varsity Speaking Academy in the books! 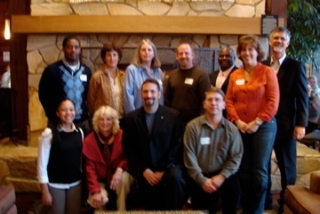 Posted on October 7, 2008 CategoriesUncategorizedTagsBusiness, Presentations, SpeakingLeave a comment on First Varsity Speaking Academy in the books! I’m enjoying a peaceful night home after a successful maiden Varsity Speaking Academy. Nine great participants and three wonderful coaches helped make this a wonderful event for all. Hey, the sun came out today, too! My appreciation goes out to all of you who took your time to come and improve your professional development. You are all ready to stand tall on the platform! One of the things we discussed was blogging. Here’s my first challenge to all you VSA graduates. Be one of the first three to post your comments about the Academy and win a prize! Do you negotiate in your job? I was recently quoted in an article for the Society for Human Resource Management (SHRM) web magazine on why sound presentation skills are so important for negotiating. “The opportunity to perform and deliver in front of a group is the best way to prepare for being in a negotiation.” Basically, the more you can practice your craft, even in a Toastmasters forum, the more confident and prepared you will be when it comes down to crunch time in negotiations. The article is written by Lin Grensing-Pophal, SPHR, who is a Wisconsin-based business journalist with HR consulting experience in employee communication, training and management issues. She is the author of Human Resource Essentials: Your Guide to Starting and Running the HR Function (SHRM, 2002). I was presenting a class last night to a group who wanted to improve their speaking skills. We spent the last hour discussing the importance of storytelling. One of the participants was involved in Habitat for Humanity. As we talked, it became clearer to him that opening his apresentation with a poignant story that engages the audience is far more effective that rattling off the methodology of what Habitat does, or how they do it. People relate to people. The other participants in the class were a great beta test for his story. What about you? What personal, humorous, or pithy story do you have that will connect you to your audience from the start? Make it easy on yourself by starting a story file. Make a written or electronic file and chronicle all your best stories so you can have them accessible for that next speech or presentation. It will make the difference in how you connect.